Origins is one of those brands that I know I can rely on for good skin care. Although some of them can be quite expensive, I'm one of those people that believe you get what you pay for when it comes to skin care so tend to lean towards the more high end brands rather than drugstore. 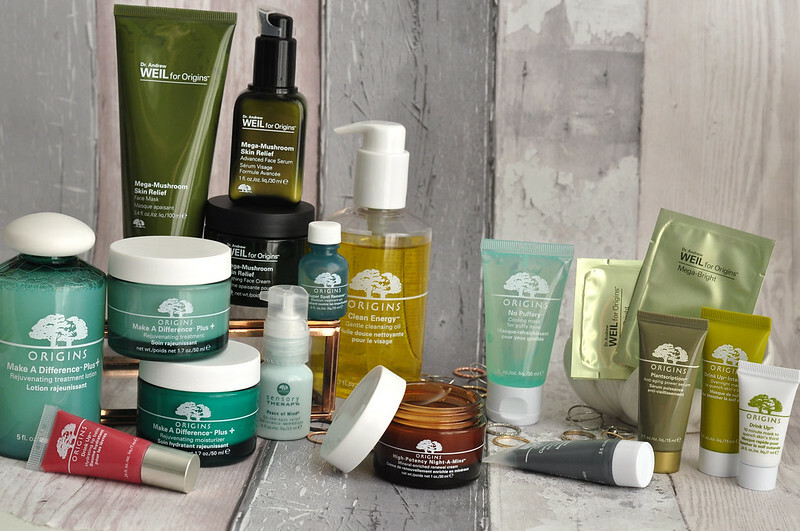 Over the years I've tried a lot of different products from Origins thanks to samples and trialling a lot of different products to find the perfect routine. Like the other few brand overviews I've done, balance Me and Trilogy, I'm sharing brief reviews of all the products I have tried so far from the company. Skin Relief Face Mask | £36 // For some reason, out of all the face masks I own, I use this one the least and I'm not really sure why. It's aimed at irritation and redness which are two of my main skin concerns but it's just one that I don't reach for that often. It feels calming on the skin and although it's not obvious straight away, over time it really does help to reduce redness. I'm going to put this one to the front of my skin care shelf and make an effort to use it more often. I do think it's slightly over priced though considering the other face masks from Origins are £23. Skin Relief Advanced Face Serum | £49-£60 // I got a decent sized sample of this from an Origins counter which lasted me about a month so I was able to really test it out before buying the full size as it's not cheap. If you can, I'd always recommend trying to get a sample first and in my experience, the staff on the counters are always really helpful and happy to give samples, especially if you're already buying a product or show an interest and say you'll come back if you want to buy it. As with all the Mega Mushroom products I have, I reach for this serum when my skin is showing signs that I'm feeling stressed and my skin is irritated. The serum especially is really calming to the skin and the consistency reminds me of the Caudalie Vinosource SOS Thirst Quenching Serum. It's a thin serum, only a tiny amount is needed and it sinks in straight away without leaving the skin feeling sticky. Skin Relief Soothing Face Cream | £50 // This moisturiser has recently been reformulated and although I assume it hasn't changed too much, I can only comment on the old formula. This is one that I really recommend you trying to get a sample of before buying. Similar to the serum, my sample lasted about a month so enough time to truly test it out. I loved the cream and how it felt on my skin so I bought the full size. Fast forward a few months and for some reason my skin just isn't agreeing to this cream anymore. It feels like the cream is just sitting on my skin and not sinking in and leaving it feeling greasy no matter how little I apply. It might just be because my skin has changed a bit since I first bought it but I can't say I'll be sad when this tub is empty. It's going to be different for everyone hence why I recommend getting a sample. Rejuvenating Treatment Lotion | £20 // This is another new addition to my skin care routine after Suzie raved about it in one of her recent videos a long with the rejuvenating moisturiser. I use this as my hydrating toner step in my skin care routine and apply a bit onto a cotton pad and then swipe it all over my face. I've only been using it a couple of times a week for a few weeks but so far I'm really liking it. I am going through it quite quickly though so it could be quit an expensive product if used everyday. It hydrates my skin, which is much needed now my skin is getting drier with the weather changing, but it also helps to calm my skin down especially if it goes a bit red after cleansing. I use this morning or evening when I feel like I need an extra boost. Another product on my to try list is the serum from the Make A Difference range. Rejuvenating Treatment | £34.50 // This was one of the first Origins products I tried after Kate raved about it and it deserves all the hype it has gotten. I don't use this on a daily basis, unless my skin is particularly acting up, but every now and again I'll use it after I've applied my serum and in place of a moisturiser. It's oil free so is perfect for any skin type and even with dry skin I don't find it less moisturising because it's oil free. I tend to use this when my skin breaks out but is still dry and it really does make a difference as the name suggests. My skin doesn't get on with heavy moisturisers that tend to just sit on the skin and this is the complete opposite. It has a sort of gel texture that feels weightless on the skin, it also has an amazing scent. I can see myself always having a pot of this in my collection. Rejuvenating Moisturiser | £34.50 // As I mentioned this is a new product I've been trying out so I haven't been using it for too long, just under a month. Like the treatment cream, this feels very light on the skin but has the usual Origins moisturiser texture, moisturising but sinks in quickly and doesn't feel too heavy. So far I'm loving this one but I'm sure I'll be writing a proper review after I've used it for a bit longer. Refreshing Eye Cream | £23 // Despite this being a holy grail product for a lot of people and has so much hype around it, I wasn't a fan of it. I just didn't notice a difference to my eye area when I used it and didn't find it very moisturising or brightening. I kind of felt like my eye area would look exactly the same when I didn't apply this compared to when I would. Luckily I never bought the full size instead I had a couple of sachets from other orders. Anti-aging Power Serum | £48-£62 // This is the newest product that I've tried as it was only released last month and I got a generous sized sample in my September Glossybox. As I've said before on my blog at the moment I'm not too concerned with anti-aging products, instead I'm simply trying to combat sensitivity, dryness and redness with a few spots here and there. I do use some anti-aging products in my skin care routine as they're often quite moisturising. This serum helps reduce the appearance of lines and wrinkles. It leaves your skin feeling plump and silky smooth sort of like after applying a silicone primer. Although you can't really tell how anti-aging products work in the long run, only time will tell, but after applying this you can see a difference to fine lines and they just look a little bit blurred. Skin Tone Correcting Serum | £49-£62 // If I finished all of the serums I currently own this would be the one I'd go out to buy next. I've gone through about five or so sachets of this serum and am always impressed by it each time I use it. Like the other serums by Origins this one feels very light on the skin and doesn't feel sticky. As I have dry skin my skin can look quite dull sometimes so this serum helps to make it look brighter and just more awake. It also helps to even out my skin tone. This is the only product from the Mega Bright range that I've tried but I'm intrigued by the others. Super Spot Remover | £15 // When I first bought this spot treatment I was pretty disappointed with it as no matter how little I applied, it just seemed to irritate my skin and not do anything to the spot itself. Now though for whatever reason it has started to work really well for my skin. I put a small amount on a cotton bud and apply the gel to only the spot and just leave it to sink in. I tend to do this at night and then when I wake up there's a noticeable difference. It wont make spots disappear immediately but they look smaller and less red. The bottle is tiny and the price seems a lot but only a small amount is needed at a time so it'll last a really long time. Sensory Therapy Peace Of Mind On-The-Spot Relief | £13 // This is a must if you suffer with anxiety or panic attacks and I either keep this by my bedside table or in my bag. Apply a pump or two to your hands and inhale the scent with three deep breaths and then massage the leftover cream onto the back of your neck, temples or earlobes. The scent a lone really helps me to calm down if I'm feeling panicky and I think it's down to simply concentrating on breathing and the deep breaths rather than what is making you panic. It may just be a placebo but it works for me and I'm going to stick with it. Clean Energy Gentle Cleansing Oil | £22.50 // I haven't tried too many cleansing oils before as I prefer a balm cleanser but they're perfect to use to remove make-up before cleansing. Apply a pump or two onto dry skin and massage it in to dissolve make-up. This also works really well on eye make-up as well and doesn't irritate my eyes. Add a bit of water to the skin to emulsify the oil and then remove with either water or a muslin cloth/flannel. The only disappointing thing about this is the packaging as you have to buy the pump separately. It does make a massive difference though buying the pump as it means you can control how much product you need and you don't waste any. I will say that if you're looking for a cheaper alternative then the Una Brennan Superfacialist Vitamin C Renew Cleansing Oil is very similar and about half the price although it's often on offer and cheaper. Modern Friction Face Scrub | £33 // I'm not a huge fan of manual face scrubs in general as they are either too harsh for my sensitive skin and irritate it or aren't abrasive enough and feel like it isn't doing anything to my skin. This is one of the ones that doesn't really feel like it's doing anything and for £33 you'd expect it to do a great job. It feels more like a cleanser with tiny exfoliating particles in it instead of an exfoliator. I'd give this one a miss if I was you! Never A Dull Moment Skin-brightening Face Polisher With Fruit Extracts | £25 // This face scrub on the other hand I really quite like and it's cheaper as well. This exfoliator contains fruit acids as well as crushed papaya to get rid of dead skin. Since I have sensitive skin I tend to avoid my cheeks which is the most sensitive part and apply it everywhere else. It has a very thick texture so I mix it with a little bit of water to make it easier to apply and so it doesn't drag my skin. I'd only use it once a week as well because of my skin. I am yet to buy the full size, I've only had a sample pot before, as it's out of stock every time I go to buy it. High Potency Night-A-Mins Mineral-enriched Renewal Cream | £34.50 // I'm about half way through my jar and I'm still loving this moisturiser. Although it's called Night-A-Mins I still use it in the morning if I feel like it although I do have dry skin so those with oily skin might want to stick to it at night. I love the orange scent and it's moisturising without that heavy feeling that other thick night creams have. This is another one that really helps to brighten dull skin and makes your skin look renewed when you wake up in the morning. No Puffery Cooling Mask For Puffy Eyes | £24 // This is a must if you suffer from either puffy eyes when you wake up or hayfever in the summer months. It's definitely an essential for me! Apply a small amount around your eyes and leave on for a bit and you'll notice an instant cooling effect and a difference to puffiness. Drink Up Intensive Overnight Mask | £23 // This is another new product to me but one I've heard so much about. I really like the Drink Up 10 Minute Mask but this overnight version is amazing. I apply a thin layer after cleansing and that's it, no need for a serum or moisturiser as this mask is incredibly moisturising. It doesn't take long to sink in so isn't like your traditional face mask in that there is no need to wash it off even in the morning. Sometimes I'll apply this in the morning as well especially if my skin is drier than usual. Once I finish the mini tube I have I'll be buying the full size. It also has an amazing apricot scent and would be the perfect mask to take with you on a plane. Drink Up 10 Minute Mask | £23 // This is very similar to the Intensive Mask but you only apply it for ten minutes then wash it off. It has the same apricot scent and is still very moisturising but not as impressive. I say skip this one and stick with the overnight version as you certainly don't need both. Clear Improvement Active Charcoal Mask | £23 // Like other mud masks, I only apply this a long my t-zone as this is my problem area and the least sensitive part. As you can see with a lot of the Origins products I have, I first tried them all through sample sizes and this is one of them. I currently have two generous sized sample tubes and the first one is still going strong despite using it a lot. Although I do get a greasy t-zone every now and again, my main problem is clogged pores and this charcoal mask is ideal for this. The charcoal helps to draw out the impurities and you can tell a difference straight away after using this. Another bonus is that this mask is available to buy in pods which is perfect for travel. Another one I will eventually buy in full size! Drink Up Hydrating Lip Balm in Berry Splash | £16 // I got this mini tube as a gift with purchase when I made my last order. I wouldn't buy this myself as it's not something I use on an everyday basis and is quite expensive but it's a nice lip balm/gloss hybrid. Although it looks quite dark and pigmented in the tube it's actually a very sheer gloss on the lips. This was such a helpful post for someone who has never tried a single thing from Origins!!! What a comprehensive review of Origins products, I love some of their ranges and this was very helpful! I wish I owned this much from Origins!